These Security companies are dependent on sub-contracting most of their services to cheaper security companies (please refer to 3). This category primarily focuses on pleasing the shareholders which have purchased stocks in the company. This category does not focus on serving the end-consumer, the Client, who is actually purchasing the security services. This method of operation leaves the Clients and their property vulnerable in many ways. Publicly Traded Security Companies sub-contract small, cheap security companies who are often un-licensed, un-trained, non-accredited and have not purchased WCB coverage or private liability insurance. The Client is under the impression that they have purchased high-profile security guard service yet an un-licensed, sub-contracted security guard without training arrives on-site wearing the Publicly Traded Security Company uniform. This method primarily benefits the shareholders who’s stocks continue to increase every time the Publicly Traded Security Companies reduce quality to cut costs. These Security companies are also dependent on sub-contracting most of their services to cheaper security companies (please refer to 3) to reduce quality and cut costs but may or may not be Publicly Traded. This category tends to lack vision and a clear business model, hence; they keep moving erratically. They create extremely high overhead for themselves unnecessarily due to reckless over-spending in attempt to mimic Publicly Traded Security Companies. Erratic Security Companies constantly change their branding, appearance, and other luxuries such as their office, all which expenses are paid for by the end-consumer. It’s easy to spot the Erratic Security Companies because they frequently change their price structure, update their logo multiple times per year and rush to follow popular trends such as painting their black security vehicles green, then black again as soon as the trend is over. Erratic Security Companies over-charge their Clients and under-pay their workers, in order to cover the high expense of all their erratic movement. Focus on a cheap price for security services and completely neglecting the quality of these services. Lack of infrastructure and lack of back-up Field Support in case of an emergency. SecuriWORLD Canada is named after three factors. First, Security is our Mission. Second, World is our Vision. Last, Canada is our Ambition. 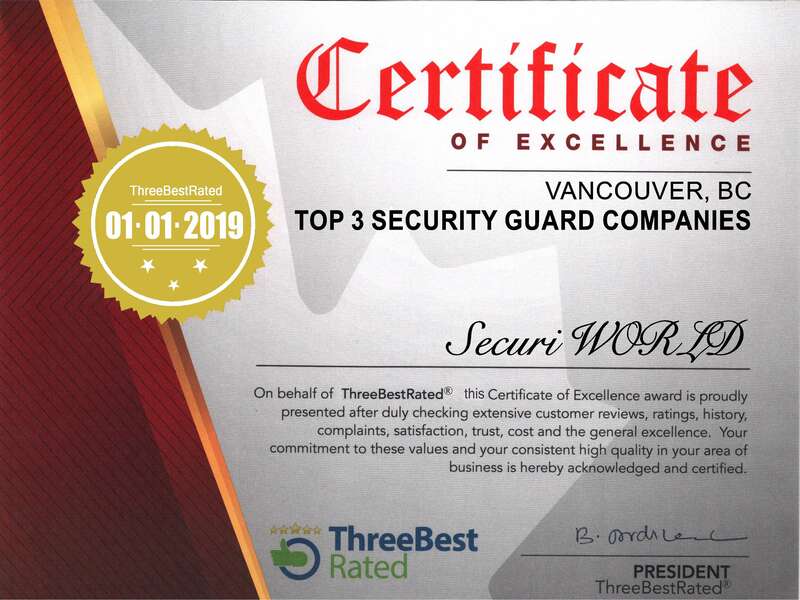 SecuriWORLD Canada is revolutionary in its field and has become the leading security company in the Vancouver security industry. Centrally located in Vancouver, SecuriWORLD services Burnaby, Coquitlam, and every other city in the Greater Vancouver area including the Fraser Valley, and the Tri-Cities. SecuriWORLD is a fully independent Security Company. We don't sub-contract our work neither do we agree to work through a sub-contractual basis. We are fully insured, accredited and WCB registered. The key to SecuriWORLD’s continuous success year after year is by only using qualified staff to perform and monitor other staff with the use of high tech software. Our scheduling processes are based on the training and qualification of our Security Guards. SecuriWORLD hires more than 100 Security Guards each year to under-go strict training modules which are specifically designed for each category of security service such as Concierge, Loss Prevention, Event Security, Site Security, $9.99 Mobile Patrol Security, Bodyguard Services and other Specialized Security Services.